Ages 8 through 17. 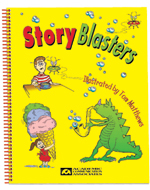 Use the creative illustrations and story starters in this book to help students develop storytelling skills and improve oral expression. A story starter relating to the action depicted in an illustration is first presented, and the student's task is to tell the rest of the story. The humorous 8.5"x 11" illustrations are great for eliciting stories from students who need high-interest materials. Reproducible worksheets are included. The storytelling activities were developed primarily for use in language development programs. The activities can be administered by speech-language pathologists, special education teachers, teachers in general education programs, and others. The humorous pictures motivate students to be imaginative in their use of language.